“Climate Change” is a hotbed topic among politicians, scientists, environmentalists, and many every-day people that live on Planet Earth. Are WE causing the change? Or is this a normal, scientific event that has no cause, but rather, is simply Mother Nature. Below are records pertaining to climate change found throughout different agencies. Two Degrees of Separation: Abrupt Climate Change and the Adverse Impact to US National Security, April 2009 [55 Pages, 0.9MB] – Scientific evidence indicates recent global climate trends which if remain unchanged or develop further could result in abrupt climate change. Abrupt climate change could result in serious environmental and social impacts. The most serious environmental impact would be the disruption of the natural processes which sustain, feed, and fuel people and nations. The disruption of these natural ecosystem processes could result in the scarcity and/or inaccessibility of vital natural resources like water, food, and energy supplies. Scarcity and/or inaccessibility of vital natural resources could create social and political turmoil and adversely impact regional stability and homeland security. As the US is the largest historical producer of carbon dioxide, the most prevalent of the greenhouse gases, it should reform and adopt policies to adapt to the effects and/or mitigate the onset of abrupt climate change. Failure to take action will leave the US vulnerable to the environmental, social, and political impacts of abrupt climate change and threaten national security and vital US interests. Should the U.S. Ratify the Kyoto Treaty? 27 March 2009 by Lieutenant Colonel Adrian C. Poné [30 Pages, 0.7MB] – Global warming is a serious issue but also a contentious one; perhaps the fate of the planet hinges on man’s ability to limit anthropogenic greenhouse gases such as carbon dioxide (CO2), which to some, is causing an alarming rise in the earth’s temperature, with potentially catastrophic results. And yet to others, the global warming issue is a non-issue, the so-called global warming alarmism is really no cause for concern, and the investment in reducing CO2 is not worth the benefit. At the center of the debate is the Kyoto protocol, an international treaty which mandates reduction in CO2 emissions, primarily from industrial nations to pre-1990 levels. To date, the U.S. has not ratified Kyoto while over almost all the world’s countries, have. This paper will examine Kyoto and the impact of signing it. In doing so, this paper will discuss global warming, is it real, and is man causing it? This paper will explore many of the issues surrounding the global warming debate, the ramifications of ratifying Kyoto and the costs and benefits of adopting a “greener” society. How America Can Look Within to Achieve Energy Security and Reduce Global Warming, September 2008 [113 Pages, 5.3MB] – Making major gains in energy efficiency is one of the most economical and effective ways our nation can wean itself off its dependence on foreign oil and reduce its emissions of greenhouse gases. Transportation and buildings, which account for two thirds of American energy usage, consume far more than they need to, but even though there are many affordable energy efficient technologies that can save consumers money, market imperfections inhibit their adoption. To overcome the barriers, the federal government must adopt policies that will transform the investments into economic and societal benefit. And the federal government must invest in research and development programs that target energy efficiency. Energy efficiency is one of America’s great hidden energy reserves. We should begin tapping it now. Global Warming Could Have a Chilling Effect on the Military, October 2003 [9 Pages, 0.7MB] – Most debates and studies addressing potential climate change have focused on the buildup of industrial greenhouse gases in the atmosphere and a gradual increase in global temperatures. But this “slow ramp” climate change scenario ignores recent and rapidly advancing evidence that Earth’s climate repeatedly has become much colder, warmer, wetter, or drier-in time spans as short as three to 10 years. Earth’s climate system appears to have sensitive thresholds, the crossing of which shifts the system into different modes of operation and triggers rapid, non-linear, and not necessarily global changes. This new paradigm of abrupt climate change does not appear to be on the radar screens of military planners, who treat climate change as a long term, low-level threat, with mostly sociological, not national security, implications. But intense and abrupt climate changes could escalate environmental issues into unanticipated security threats, and could compromise an unprepared military. The global ocean circulation system, often called the Ocean Conveyor, can change rapidly and shift the distribution patterns of heat and rainfall over large areas of the globe. The North Atlantic region is particularly vulnerable to abrupt regional coolings linked to ocean circulation changes. Global warming and ocean circulation changes also threaten the Arctic Ocean’s sea ice cover. Beyond the abrupt climatic impacts, fundamental changes in ocean circulation also have immediate naval implications. Recent evidence suggests that the oceans already may be experiencing large-scale changes that could affect Earth’s climate. Military planners should begin to consider potential abrupt climate change scenarios and their impacts on national defense. JPRS Report, Environmental Issues, Japan: Response Strategies for Global Warming Studied, 12 June 1990 [134 Pages, 4.9MB] – This report contains the proceedings carried out between January and June 1989 by the subgroups of the Advisory Committee on Climate change whose aim was to assess the environmental impacts and to evaluate response strategies. This follows the first interim report submitted in November 1988 by the Advisory Committee on climate change. This volume contains summaries of the reports given by the members of the subgroups. Interest in the global warming effect has seen a soaring increase over the past year. However, a comprehensive and in-depth understanding of the problem is quite difficult to attain even among specialists within the field. Furthermore, the studies being conducted by the IPCC (Intergovernmental Panel on Climatic Change) on the scientific aspects, environmental and socioeconomic impacts, and response strategies have not yet laid down any guidelines. Thus, with this background in view, these groups have conducted their own investigations on similar categories as is being considered by IPCC, in order to sort out the issues involved in the problem. Although this report was prepared with the intension of integrating all knowledge on the issue, it cannot be said to cover all views currently held both inside and outside of Japan. To cope with the global warming problem, considerations of more specific issues are needed. The present interim report, although not as comprehensive as desired, has been made public with the intention of providing a starting point in the assessment of our common and needed efforts which are necessary in order to assess and deal with the issue of global warming more effectively. Military Implications of Global Warming, 20 May 1999 [42 Pages, 1.3MB] – The 1998 National Security Strategy repeatedly cites global environmental issues as key to the long-term security of the United States. Similarly, U.S. environmental issues also have important global implications. This paper analyzes current U.S. Policy as it pertains to global warming and climate change. It discusses related economic factors and environmental concerns. It assesses current White House policy as it relates to the U.S. military. It reviews the Department of Defense strategy for energy conservation and reduction of greenhouse gases. Finally, it offers recommendations and options for military involvement to reduce global warming. Global warming and other environmental issues are important to the U.S. military. As the United States leadership in environmental matters encourages global stability, the U.S. military will be able to focus more on readiness and on military training and operations. Global-Warming: A National Security Issue, 13 Feb 2006 [22 Pages, 0.2MB] – The waters in the Canadian Arctic are quickly becoming free to navigate due to global warming. international shipping bombards the region, the United States and Canada must be ready to face the security implications that will arise. A failure to do so may leave an opening for another terrorist strike on American soil. We must also be prepared to protect our interests in the region. Focus on Arctic oil is becoming a reality as we move towards freeing ourselves from dependence on oil from the Middle East. Preparing for operations in the Arctic must begin with a strong and cooperative relationship with our Canadian neighbors. Differences must be settled quickly particularly the issue over the sovereignty of the Canadian archipelago. We must also understand the implications of operating in the north with respect to the indigenous population and the environment. The success of the operations in the north depends on proactive planning now is the time. 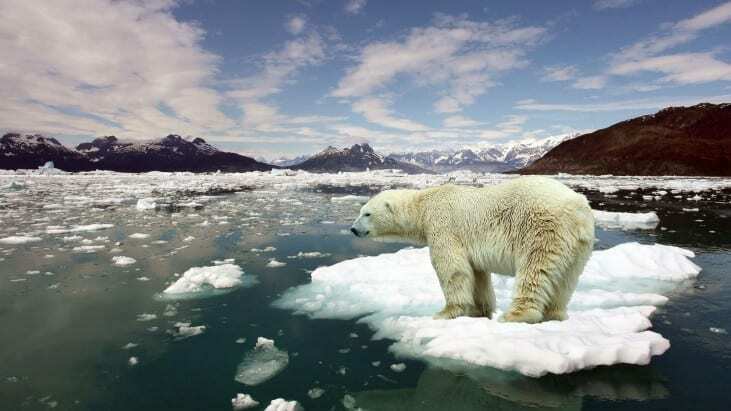 Global Warming: Its Implications for US National Security Policy, 19 March 2009 [30 Pages, 0.4MB] – The approach to this topic will be to look at the science behind anthropogenic global warming. Is man largely responsible for causing global warming due to anthropogenic greenhouse gas emissions, or is this climate change part of a natural cycle? Both sides of the issue will be addressed. This paper will then investigate the nexus between global warming and U.S. national security policy. It will address the challenges facing U.S. leaders and policy makers as they tackle the issue of global warming and its implications for U.S. policy. Finally it will conclude with recommendations for those leaders as the U.S. seeks to ameliorate the impact of global climate change, and thereby improve U.S. national security. National Security Implications of Global Warming Policy, March 2010 [29 Pages, 0.7MB] – Although numerous historical examples demonstrate how actual climate change has contributed to the rise and fall of powers, global warming, in and of itself, is not our nation’s greatest climate threat. Rather, the greatest climate threat to national security is the world’s perception of climate change and the resulting governmental and intergovernmental policies enacted to reduce the theorized anthropogenic greenhouse warming. As governments become convinced that global warming is universally bad and humans are the primary cause, political leaders may develop ill-advised policies restricting US access and use of global energy supplies, weaken the US economy, and unfairly advantage rising developing nations. These three actions could combine to threaten United States security by reducing our relative national power in comparison with rising nations. Rather than adopting multilateral policies aimed at reducing the carbon emissions of developed nations, the United States should continue to resist adopting Kyoto Protocol type policies to preserve our national wealth to better fund Homeland Defense and national security.